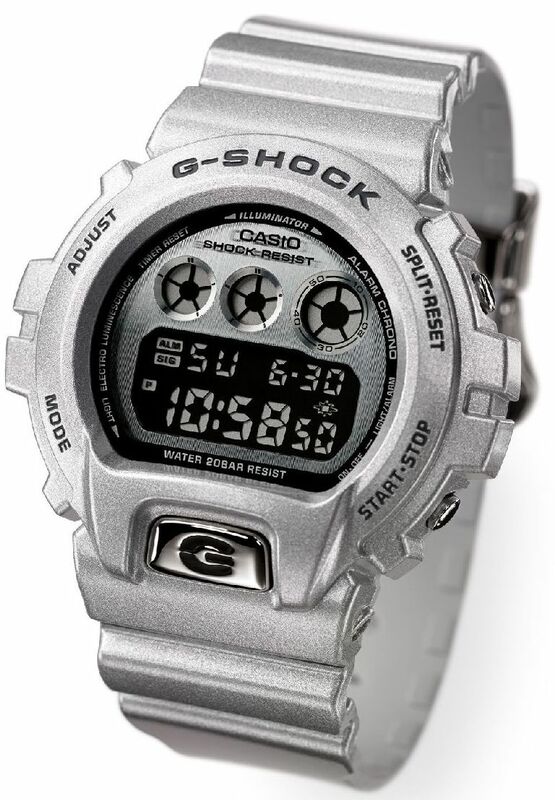 Casio’s new limited-edition G-SHOCK watch DW-6930BS-8DR has been executed in a lustrous metallic silver finish, as a symbol of the progress toward the future represented by G-SHOCK in the motif of a statue newly on display in the Casio booth at Baselworld 2013. With only 5,000 units to be released worldwide, this special model is one in a series designed to mark the 30th anniversary of the G-SHOCK shock-resistant watch. The design of the new DW-6930BS-8DR is based on the popular DW-6900, characterized by a rounded shape that arose from the pursuit of even greater toughness. As a symbol of the G-SHOCK affinity with the future, this 30th anniversary model has been given a metallic silver finish that makes the entire watch gleam. In addition to front and side buttons with a mirror finish, the dial has been given a brushed-metal look that reflects light differently depending on the angle. The white-on-black LCD further accentuates the brilliance of the futuristic metallic silver look. The watch’s back plate is engraved with the G-SHOCK 30th anniversary logo designed by Eric Haze, Brooklyn base graphic Artist, while the strap keeper is emblazoned with “Since 1983,” and three stars to represent 30 years. These details demonstrate its importance as a commemorative model. It also comes with a keepsake 30th anniversary medallion made of aluminum, the same material used to make a DW-6900 statue now on display in the Casio booth at Baselworld 2013. Finally, the custom packaging features the same color scheme of silver and black used for the DW-6930BS-8DR itself. These features combine to form a very special set.